New food containers by True Source Products (TSP), made with Eastman Tritan copolyester, meet consumer demands for containers that are durable and free of bisphenol A (BPA). TSP is an American company specializing in food storage. The company’s newest container line features Tritan, a new-generation copolyester that is dishwasher durable, tough and has crystal-clear clarity. 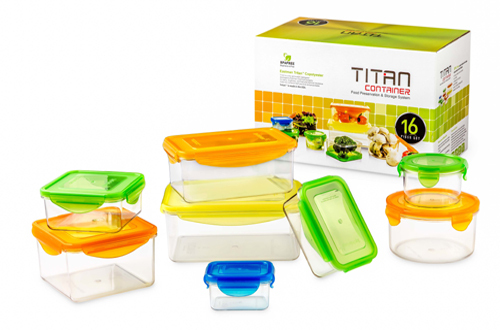 TSP’s new TITAN line made with Tritan includes multiple shapes and sizes, including rectangle, square and round containers, as well as a sixteen piece assorted box set. Before TSP’s introduction to the Eastman Tritan copolyester material, its containers were made of glass and prone to breakage. In the search for a material that could provide a safe, durable alternative for customers, TSP decided Tritan was suitable for the application. Beyond being BPA-free, Eastman Tritan copolyester allowed TSP containers to be freezer, heat and stain resistant and free of plastic odor and taste, all while preserving freshness with an airtight lid.